It’s award show season, and being that Oxford’s home is on Music Mountain, we bet you can guess which one is our favorite (hint: it rhymes with Sammy). But we weren’t watching just to see Taylor’s midriff, Adele bring down the house or Kendrick leave everyone speechless – we’re ad people, so we were watching a little differently. 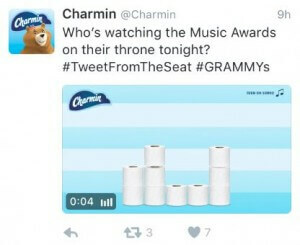 Because most of the commercial time during award shows is traditionally used to feature movie trailers and advertising for new network shows, we decided to do a deep dive into the digital sphere to see how both Paid Search and social were integrated with what was happening on TV before and during the Grammy Awards. 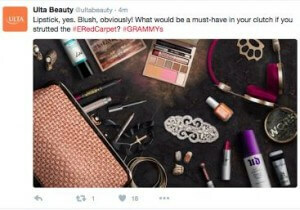 SEM Specialist Christine Gray and Digital Media Manager Jordyn Rudolf took to the Web to see what was going on behind the scenes digitally in the lead-up to the Grammys. 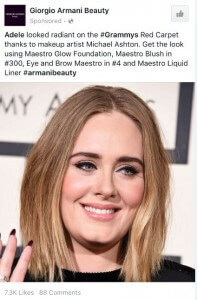 - Paid Search ads served before the Grammys, but not during. 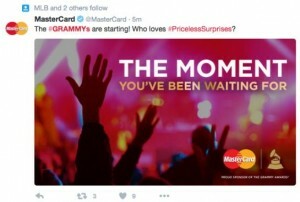 MasterCard did not have a Grammy-related description. We believe we triggered the ad by searching “2016” in the keyword phrase. It was a broad match keyword on numbers and generated a low-quality ad. - EOnline and CBS were bidding on Grammy keywords. - Most advertising was done through social media channels and CBS – meaning while the website is a highly authoritative site in the search engine eyes, they did not focus on website promotion. - Top traffic pages were the home page and the nominees pages. Our crack team of social mavens – Maddie Horvath, Sarah Phillips and Ashley Wood – kept one eye on their phones and the other on their televisions throughout the broadcast, looking for trends, brand reactions and the hottest hashtags of the moment. - Social media was plugged throughout the show with #Grammys and LL Cool J asking viewers to tag him on Instagram with their thoughts on performances. Twitter was the platform of choice with very little activity coming from brand pages on Facebook, which makes sense due to Twitter’s instant gratification model. 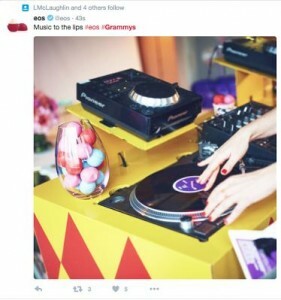 - Brands who were participating were watching and reacting live, like EOS’ “music to our lips” that included a vase full of lip balm in a recording studio set up. Alex and Ani live-tweeted the whole show because their brand’s demo is young/social. 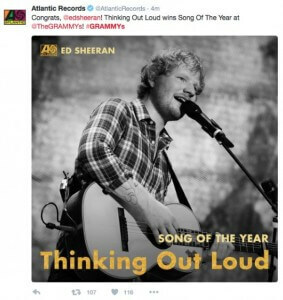 The majority of brands participating, though, were music-related – magazines, recording studios, radio stations, record companies congratulating their respective winners. Nashville Tourism called out Taylor Swift, a Nashville native who opened the show. - However, there was no sign of Oreo, Domino’s, Kohl’s … none of the typical big players that usually jump on creating timely social posts during events participated. Oreo is still the brand people think of when it comes to live tweeting and social posting because of the brand’s now infamous tweets during the 2013 Super Bowl. 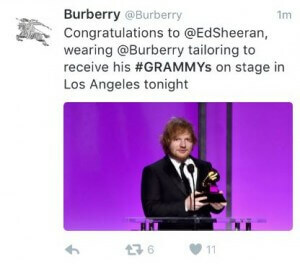 - Not every brand was tweeting about the Grammys. Years ago, all brands were jumping on all random holidays and public events. The direction social has gone is one in which brands are really thinking about where they fit into current events and making meaningful connections with their fans as opposed to jumping on the flavor of the moment. Oxford social strategy fully agrees with these brands. It’s very important in social to try to get on the same wavelength as the consumer. If something isn’t relevant to them, you don’t have to post about it. 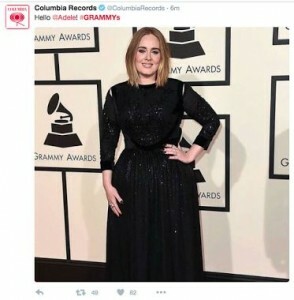 - The fickleness of trends: #Grammys was not trending the morning or day after. Target and Gwen Stefani: The biggest flop of the night? - Having it filmed on live TV was a very cool gimmick, and it was well produced with bright colors, lots of choreography and coordination. - The music video had its own emojis that showed up when certain words were typed into Twitter that were made available only during the broadcast. - We loved the video! - Maddie followed Target on Periscope and got a notification on her phone once the performance went live. - There was no lead-in on TV, like, “Now presenting Gwen Stefani’s new video sponsored by Target – LIVE!" It came as a surprise and was easily missed if you decided to take a snack break during the commercial break. - It was promoted to be “live on Periscope during the commercial break” which makes it sound like the music video itself was going to be filmed by someone on Periscope; instead, they just had someone showing you what was going behind the scenes (sort of – see below). The team almost missed the music video because they thought it was all going to be shown on social, not TV, so they were paying more attention to their phones than their televisions. - No one was talking about the music video under the #Grammys hashtag, which was the more popular hashtag of the night over Target’s #MoreMusic. - Make a more relevant hashtag. #MoreMusic did not relate to Target, Gwen, the song or the Grammys specifically. We would have chosen something more along the lines of #GrammysGwen, #GwenxTarget, #MakeMeLikeYou (the name of the song Gwen was debuting), #GwenLive, etc. - At the end, “Gwen” (or a body double, which is the general online consensus), fell and it wasn’t clear if it was intentional. You want to leave people wanting more, not leave them confused. Right after it happened, instead of reaping the benefits of their 1.8 million followers tweeting their excitement and approval, Target had to go on the defense and keep repeating to fans that it was a planned fall (whether or not that’s true is up for debate). - Periscope: it’s just not there yet. Streaming is still spotty and there’s a line between being informal and conversational that is still being worked out. It wasn’t clear if Gwen was going to be hosting it on Periscope or which channel it would stream from. Only 300-500 people were watching Periscope live at the time of the music video shoot, which is pretty disappointing for a big name like Target. During the filming of the video, the representative for Target kept showing the crowd and the people around him singing … but the viewers were not interested in watching them sing; they wanted what they were promised and to see the video being made. Once the kinks are worked out, live streaming would be very beneficial for brands, but for now, it caused more harm than good for Target.